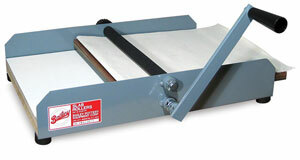 Bailey's tabletop Minimight Slab Roller rolls consistent slabs every time. It is a fantastic tool for both the professional and the hobby ceramicist. It has a painted steel frame with size guides, with Melamine counters and carbide-coated rollers. Minimight II, for Slabs up to 16"